Difficulty: Reasonably easy – a couple of climbs but nothing too steep or lengthy. A bit of rather awkward scrambling for a few metres near the end of the walk. This is a lovely walk along almost-unused earth roads. 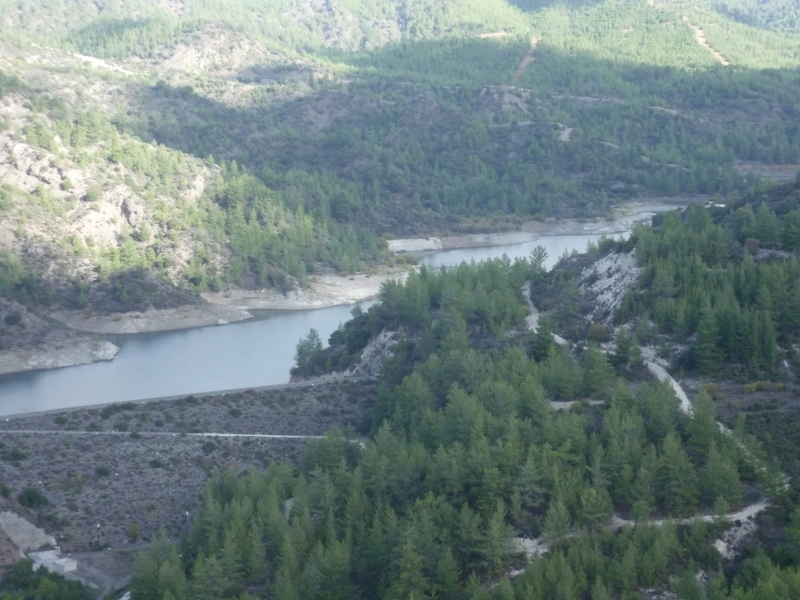 It starts from Filousa (Kelakederon) in the Dhiarizos valley, winding down to the Arminou reservoir, then up the other side to the village of Arminou before recrossing the valley to return to Filousa. There is a coffee shop in Arminou. There is a little shade along the way but there are quite long stretches with no shade at all. We have walked this in spring and late autumn but would probably not attempt it during the summer. We particularly wanted to do a walk in this area as Mark’s father was born and brought up in Filousa. 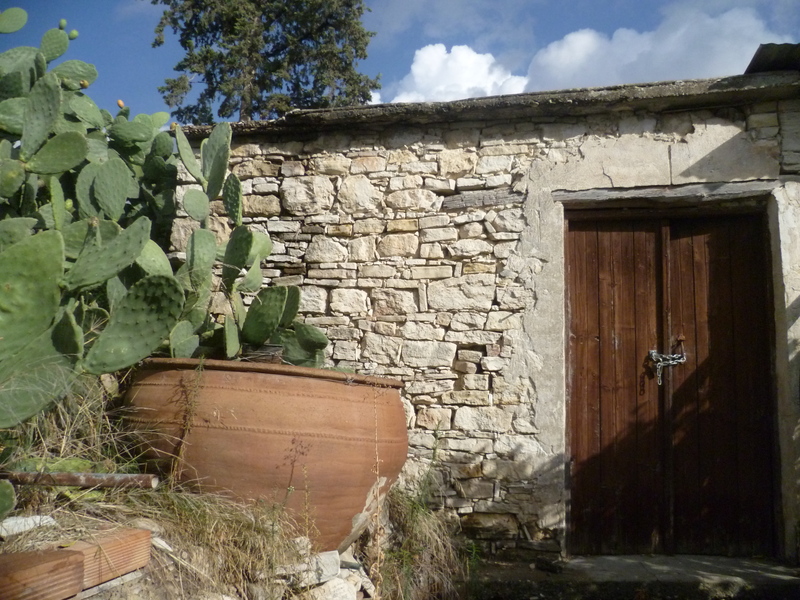 Some of his family have old houses in the village (photos below) and small vineyards in the surrounding area. A few years ago we helped to pick the grapes and make the wine using an old wooden wine press. Very delicious it was too! …although when we were recently in the village there was a surprising amount of building works going on so, currently, you may find it easier to park on the road through the village and walk through the (few) back streets until you come to the church on foot. Then begin your walk by leaving the village on the track which goes past the church (heading north) and with the church on your right. 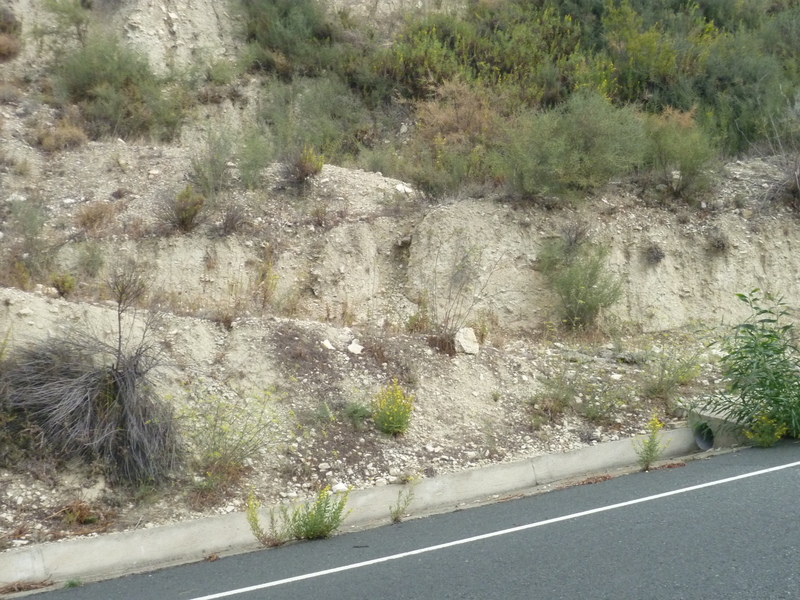 This starts out as an asphalt road, becomes concrete for a short stretch and soon turns into an earth road. Ignore a couple of left turns in the first 100 metres or so – just keep straight ahead. Follow the main track, ignoring any tracks joining from left and right. After 10 minutes you reach a sharp (hairpin) bend to the left. Follow this around to reach a three-way fork in the track – take the middle track and continue along this (effectively carrying on straight ahead on the same track). It’s very easy to follow this wide chalky track as it meanders along the contours of the valley, sometimes climbing a little, sometimes descending. You are walking through a varied landscape of cultivated fields, olive groves and pine trees with some quite spectacular ravines to your left and lovely views across the Dhiarizos valley. 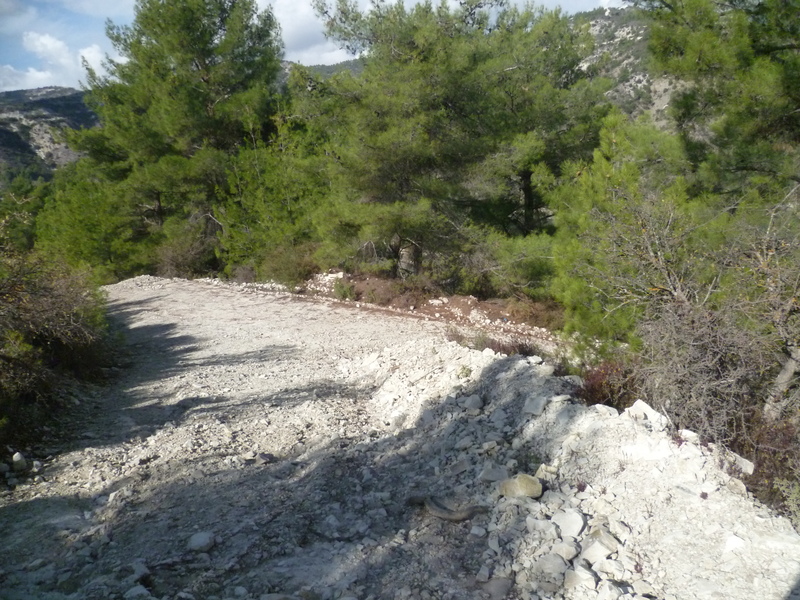 You can see Arminou on the other side of the valley and after about 35 minutes as you look down to the valley floor you will be able to see a clear white track – this is your route away from the dam later in the walk. A couple of minutes later (37 minutes), as you round a right-hand bend in the track, you will have your first views of the Arminou dam and reservoir below and to your left. Continue to follow the main track. After about 55 minutes it starts to descend more steeply. If you keep in mind that you are heading down towards the dam and you stick to the main track you can’t really go wrong. There is only really one point where you are faced with a choice. At 1 hour 5 minutes there is a junction where, to the left, the track heads downwards whilst to the right it curves round, up and away from the dam. As you would expect, take the downward left turn. 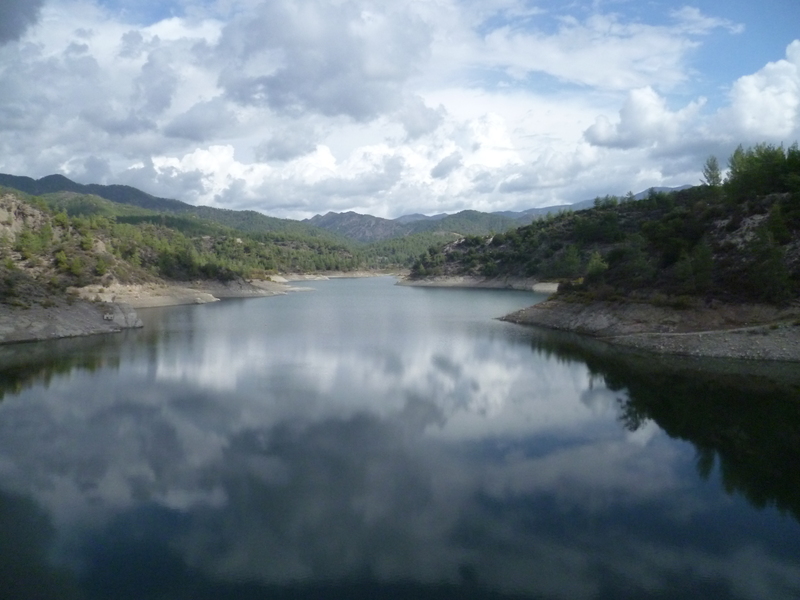 After 1 hour 25 minutes of easy walking and gradual descent you will reach the dam and the reservoir beyond. It’s worth taking some time to walk up onto the dam and enjoy the views across the reservoir – it really is a lovely spot. Note that the following timings do not take account of any stops here, so adjust them accordingly. When you are ready to continue your walk, re-trace your steps to the point where you came down from the hill and take the track which follows the river bed down the valley with the dam behind you. As you start to walk down this track notice the curious flat rock under the trees to your left – wooden benches have been set up around this natural table – very useful for a souvla picnic! There are pools at the start of this track and a river flows along the valley with reed beds and some lovely trees. Although we haven’t explored this area in detail it’s very evident that this is excellent bird-watching territory. Cross a concrete bridge over the river and walk along an unusually verdant valley bed on this easy track with hills and dramatic cliff faces rising up above you on both sides and, initially, at least, the river on your left. Over the next half an hour or so of walking this beautiful valley you will criss-cross the river a further three times on concrete bridges. After a leisurely 2 hours 5 minutes you will see a cave on your left. 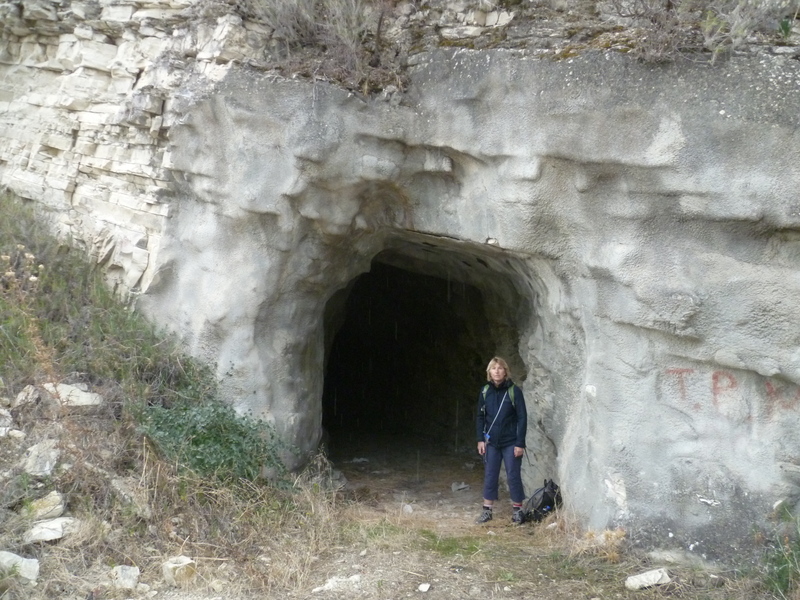 The cave goes back for about 10 metres and , as you might expect, is a home for roosting bats. We’ve sheltered here from thunderstorms in the past but have been rather tentative about going too far back into the gloom! Our relatives tell us (anecdotally) that locals used to hide in this cave to escape the attacks of Arabic invaders many centuries ago. About 100 metres beyond the cave the track meets the F618 road. Turn right onto the road, crossing the river and immediately after the bridge leave the road again to join the track which leads uphill to your right (2 hours 10 minutes). This is the old, now-defunct, road to Arminou and it zig zags up the unshaded hillside (giving panoramic views back across the valley) for 25 minutes or so before reaching the new F618 road again. 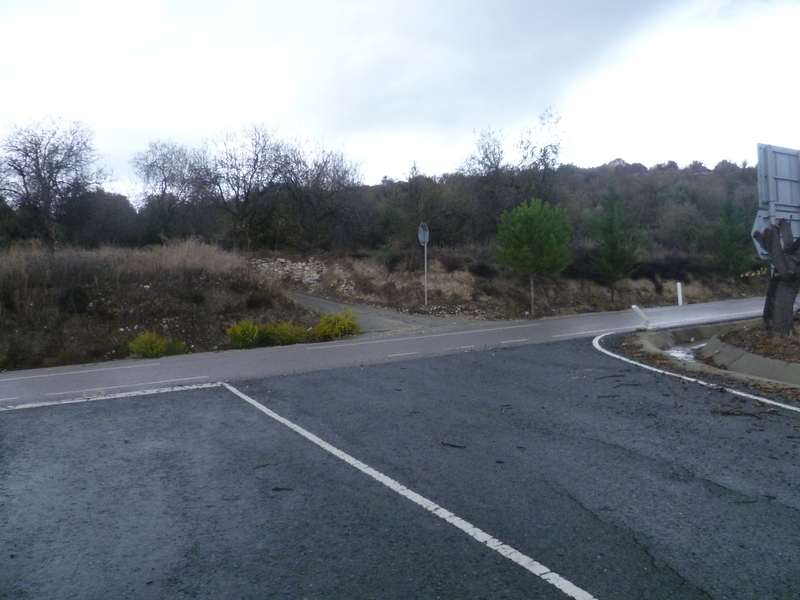 At this point, just cross the new road and join the concrete track immediately opposite which continues uphill towards Arminou (2 hours 35 minutes). Ignore tracks off to the left and right, conitnung uphill and passing a concrete water reservoir on your right at around 2 hours 44 minutes. The track then almost immediately widens out at a junction. 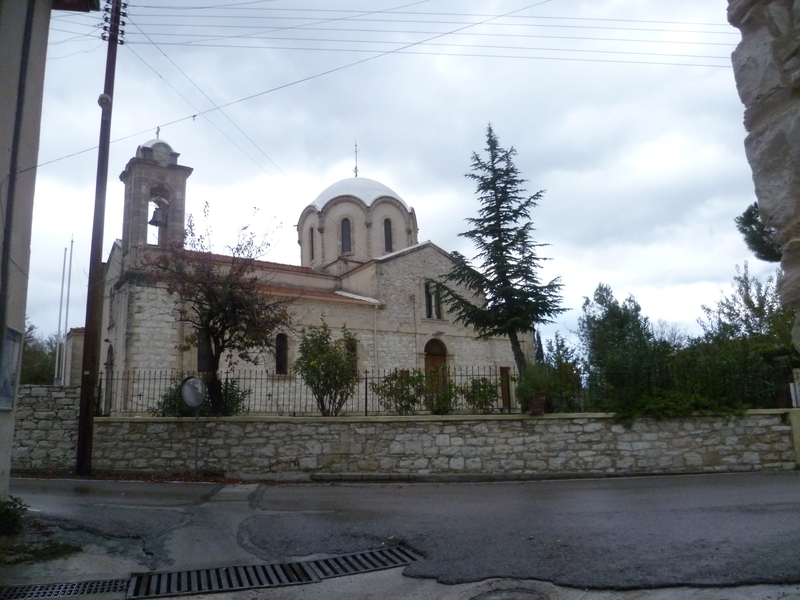 Take the right turn onto another concrete road and continue uphill along Pafos Street to arrive in Arminou at around 2 hours 55 minutes, walking into the village along some quaint narrow streets and passing some very pretty traditional stone houses. It doesn’t really matter which village streets you take; just keep heading uphill and you will probably emerge out of the streets somewhere near the central point of the church of Saint Marina. There are benches and picnic tables here, as well as a local coffee shop (which sells ice-cream!) so this may be a suitable place for lunch. When you are ready to head back towards Filousa, the first part of the return journey will involve re-tracing your steps back down the hill to the valley floor. 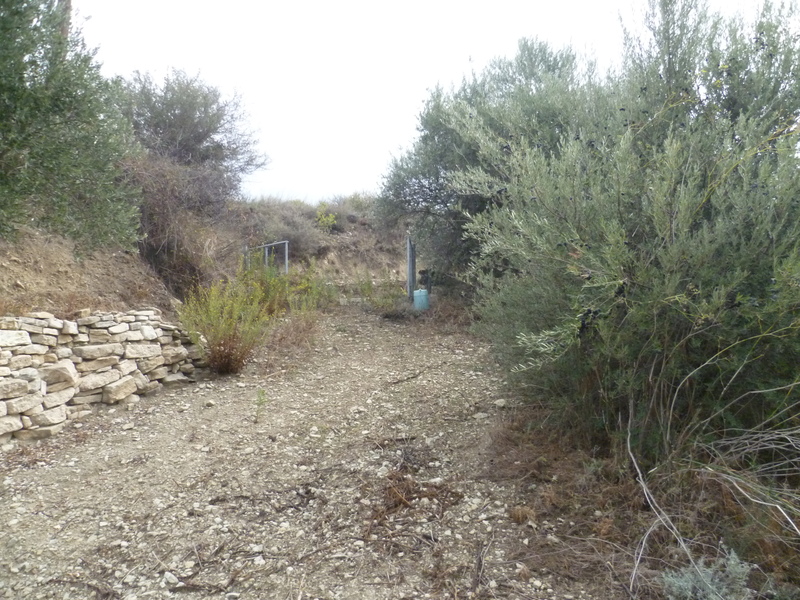 This is comparatively straightforward: you will need to wind your way back down through the village streets of Arminou, onto the downhill track, cross the F618 and down the old road back to the river bridge. A leisurely post-prandial stroll shouldn’t take much more than 35-40 minutes so, by 3 hours 35 minutes (not adjusted for lunch) you can expect to be back at the river bridge again. At this point, cross over the river (noting the old stone bridge to your right) and, very briefly, follow the F618 around and up the hill to your right. You will only be on this quiet road for about five minutes. As you walk up the road it curves around to your left. Keep your eyes peeled and, just beyond the bend, there is a small path heading across a concrete ramp up the side of the hill on your left hand side. This is at 3 hours 40 minutes. Take this track and start heading up the hill. The track is faint at first – and, yes, there are a few of those prickly brambles to be avoided (these were quite overgrown in May 2018) – but stick with it. You are heading for a telegraph pole just slightly ahead and above you and will need to zig-zag upwards to reach it. After three or four minutes you should find yourself climbing over or round a large-ish pile of boulders and then out onto a field with a few vines planted at one side. Look in front of you and to the right – the path leads clearly up through a gate (3 hours 45 minutes). Follow the path through the gate and up to the left. It soon becomes an old concrete road and begins to climb quite sharply through vineyards, passing (at about 4 hours) a house to your left. 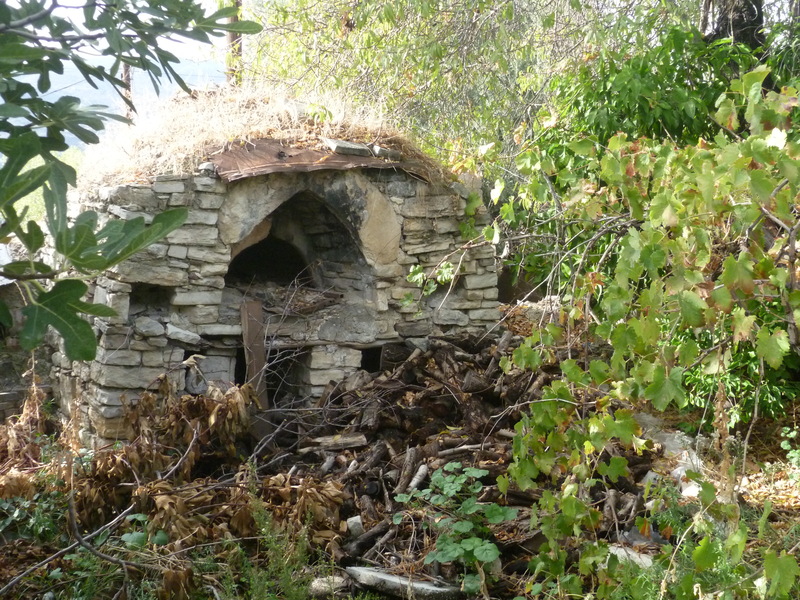 As you continue to climb up towards Filousa there are increasing signs of habitation. Just to the left of a small house (with metal gates and vines) you will need to take a left turn onto an earth track (4 hours 5 minutes). Follow this path for the next 15 minutes or so as it takes you gradually upwards towards Filousa. You should arrive conveniently back at the church in Filousa (retracing your steps for the last 100 metres or so of the walk) after approximately 4 hours 20 minutes.